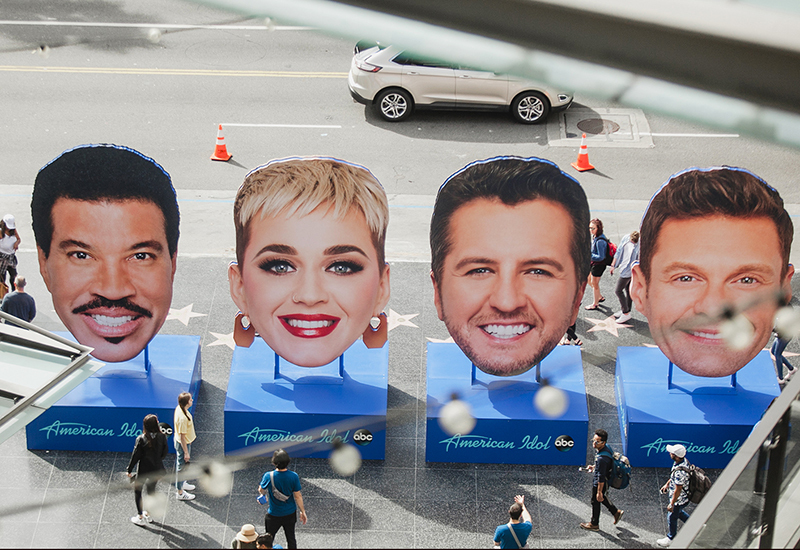 As “American Idol” moved into “Hollywood Week” on March 26—the portion of the show where a group of about 170 hopeful contestants is whittled down to just 50—the series’ new network ABC set out to go big. As in, huge. From giant statues of celebrity judges, to in-air stunts with an American Idol-branded helicopter, to surprise and delight experiences for airline passengers who received their very own golden tickets, the series drummed up excitement in myriad ways. Judges’ “heads” took flight over the Hollywood and Burbank area via a branded helicopter. 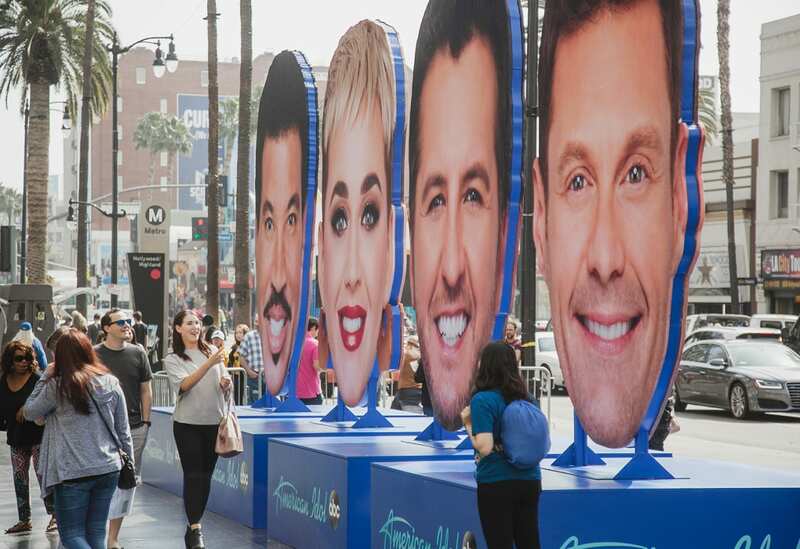 To capture the attention of passersby in the high-traffic intersection of Hollywood Boulevard and Highland Avenue, “Idol” created giant, 15-foot, 2D sculptures of this season’s superstar judges and host—Lionel Richie, Katy Perry, Luke Bryan and host and producer Ryan Seacrest—and installed them outside of the bustling metro station. The idea was to create a larger-than-life photo opportunity for people right in the heart of Hollywood and, of course, to get them excited to tune into the premiere.Another advantage to the installation’s placement: It was also Mile 12 of the LA Marathon, which meant that thousands of runners passed by the floating heads on Sunday, March 18—a great excuse for a quick break to snap a pic and share on social. What’s more, a week later on the Sunday before the “Hollywood Week” kickoff, the four “heads” took flight over the Hollywood and Burbank area via an “Idol”-branded helicopter. Aerodynamically-suited to be carried in tow and highly visible to the commuters below, the eye-catching spectacle couldn’t be missed. Giant 15-foot, 2D sculptures of this season’s judges and host were installed outside a Hollywood metro station. It all plays into the overarching campaign theme: celebrating the power of the journey. Given that the show itself highlights the journeys of everyday Americans—who might not have had the opportunity to be discovered without Idol’s efforts to scour the entire country for talent—ABC’s marketers saw an opportunity to highlight other Americans’ personal journeys by making connections with commuters and runners. 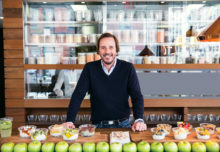 “We looked for ways to creatively connect with consumers in the location where their everyday journeys were taking place, utilizing various modes of transportation and key entry points into Hollywood in unique and memorable ways,” says Lovas. 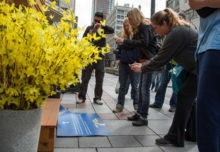 Yet another impactful moment of “Idol’s” out-of-home campaign took place inside the metro, at bus stations and beyond. To embody the idea that “all roads lead to Hollywood,” the series took over the Hollywood and Highland metro leading up to the premiere through showcasing the show’s branding and, in an engaging photo opportunity, created giant arrows accompanied by the tagline “Is this the next American Idol?” Anyone who passed had the chance to imagine becoming America’s next big star. Capitalizing even further on Idol’s theme of wish fulfillment, the team also created a clever surprise-and-delight stunt in partnership with Frontier Airlines. 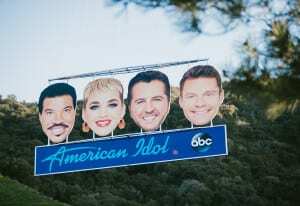 “Idol” took over all nine Frontier flights heading into LAX during the weekend ahead of “Hollywood Week,” which carried 2,000 unsuspecting passengers. Once the flights hit cruising altitude, consumers got word that they were in for something truly special. 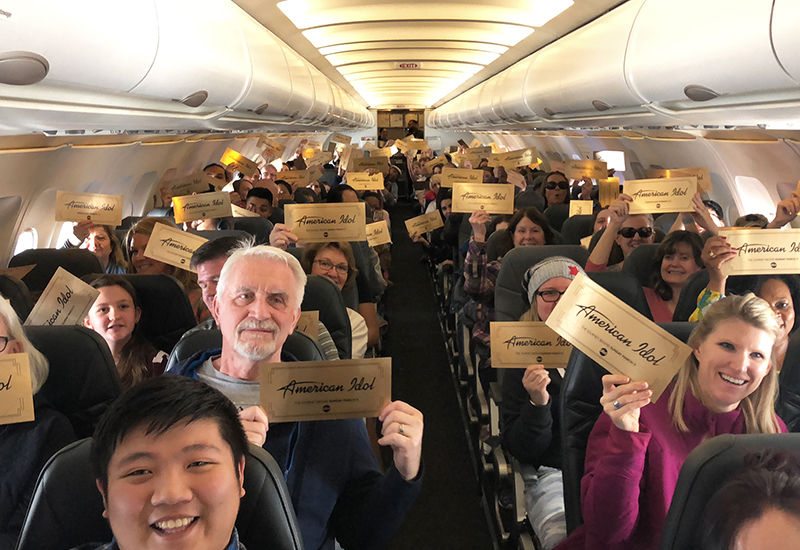 Flight attendants passed out golden tickets—similar to those given to contestants on the show—to every single passenger, each of whom was led to believe they might win something cool. Surprise, everyone won; The Golden Ticket guaranteed a $200 flight voucher to use on the passengers’ future journeys. The golden tickets themselves had both the #AmericanIdol and #FlyFrontier hashtags to encourage social sharing. Besides the flight vouchers, passengers received Idol-branded headphones and some even sang their own Idol “auditions” into the PA. Additionally, with “Idol’s” new home at ABC, marketers were able to work closely with news affiliates across the country to ensure coverage of both the floating heads and the airline stunts on local news programs. Agency: Grandesign, San Diego.